Earlier this month, Strong Towns hosted its first ever regional gathering, an event designed to start local conversations and help strong citizens connect and inspire each other to action. The North Texas Gathering combined speakers, panelists, and workshops to drive civic engagement on a variety of topics that have both regional and national relevance. Couldn’t make it? There’s no need to feel FOMO. As a follow up, we want to share some of that discussion with you. Aubrey Byron of Strong Towns (AB): Thanks for joining me! Can you tell me how you started with Active Towns, and what you were speaking about at StrongTownsNTX? John Simmerman (JS): Sure. My background is as Co-Founder of the Active Towns Initiative which is a 501(c)3. What we really do is try to get out there to profile and promote the people, programs, and places that are doing a good job of creating an environment that is conducive to a healthy culture of activity. We look at celebrating those places that are doing a good job of becoming more walkable, bikeable, and livable. The ongoing joke I have with Chuck is that a Strong Town is inherently an Active Town because you’re able to get around by other means than a single occupancy motor vehicle. What Amanda and I talked about at the regional gathering is some of the lighter, quicker, cheaper things cities and communities can do to promote more livable places. We had a pop-up park demonstration. 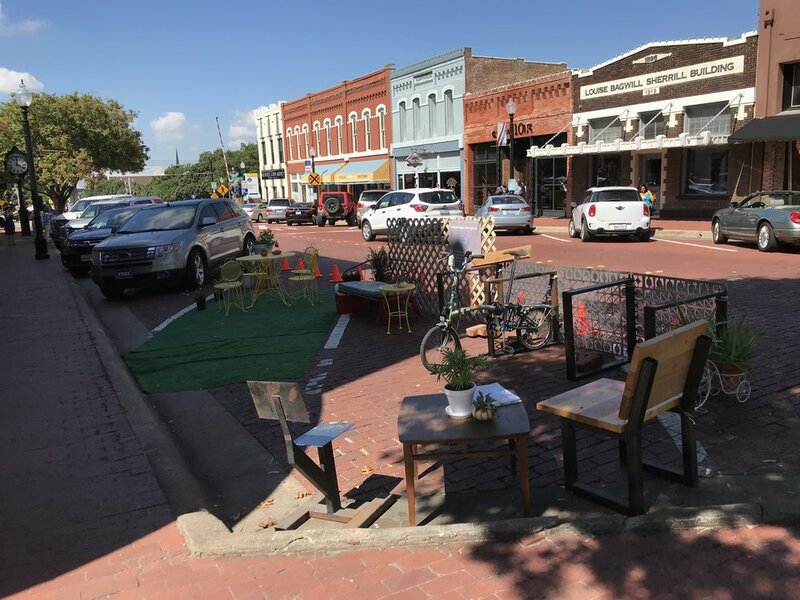 It is sort of a la the celebration of Parking Day, where you take an on-street parking space and convert it to a small park. In our case we also had a bike parking facility. Where you would normally be able to fit one car, you can have as many as ten bikes. In the presentation, I also talked about the different levels of activism or engagement people have when they’re trying to initiate change. There are four levels I see: the leadership—the politicians and directors, the staff, the advocates working in partnership with the leaders, and also the activist—the people agitating for change. They may be pushing the envelope and trying to get the attention of leadership who can make the changes. I also talked a little bit about the various stages of engagement. AB: Yeah, I really liked that concept of the role of the advocate and activist, and how there is a place for both of them in the role of seeking change. JS: Yeah, we talked a little bit about the complexity of the fact that sometimes you have people working within the city, and they have to be very careful to not be seen as too much of an advocate because of the bureaucracy they work in, even though that might be how they naturally feel because they’re passionate about the changes they like to see. Most certainly they have to make sure they’re not being perceived as an activist. JS: Sure. I’ll defer the details of the pop-up park to Amanda when she joins us, because she really was the one who orchestrated that. Her and her sister, Tracy, brought all the materials to put that together, and I just served as a supporting role. Even after the Gathering was done, they stayed there and continued to communicate with and engage community members. In general, talking about tactical urbanism and pop-up demonstrations, in the world of trying to encourage and help move things along for creating more walkable and bike-friendly communities, it’s just been a huge advance in being able to communicate in a very tactile way. Community members are actually able to see and feel what it is we’re talking about. What I mean by that is, it’s very hard. When we use the terminology—say, a “protected bike lane” or a “cycle path” or whatever—that means absolutely nothing to the general population. It’s incredibly important for people to be able to look at it, see it, feel it, be able to ride in there and experience that situation. Some of the slides I had in the slide deck of my presentation were of a pop up protected bikeway during an open streets event so people could actually see it and go, “Oh, I get it now. This is a truly, protected, separated space.” It’s incredibly valuable because when we use words and terminology, it doesn’t really help people appreciate how it feels. That’s the beauty of these pop up demonstrations and tactical urbanism strategies. Now using those four different levels we talked about, from the leader all the way to the activist, you can have pop-up demonstrations that are literally cones put out in the dead of night with a flower a la Jonathan Fertig in Boston, which is very much an activist sort of engagement. It can go all the way to the other far end, to a temporary installation of a protected bike lane from on high, where the mayor said, “Hey, this is what we’re going to do. We’re going to put this out here so you can give us feedback on it.” That’s the beauty of being able to do things this way, in a lighter, quicker, faster way to put it out there and let people experience it. It helps to start paving the way to change minds and get people on board with what’s there. And it also gives an opportunity to test different types of facilities or infrastructure to see what works best in each environment. I think it’s important to realize you can’t just copy and paste from city to city. You really do need to work with communities to figure out what’s the right fit for them. Amanda Popken: That’s an interesting point, John, about seeing it. I realized talking to people in Plano: we have these images in our head about what this stuff looks like. People don’t have visuals. What they conceive of as bike-friendly may be ugly or unappealing, or they may not have any ideas. AB: Amanda, can you tell us more about your background and how you came up with the installation? AP: My background is as an Urban Planner. I started with a Master's degree in City and Regional Planning with an emphasis in sustainability. Then I worked for the regional chamber and the City of Dallas doing economic development. I knew I wanted to go into the planning side eventually but was really enjoying learning about the economic development side of things. We were doing a lot of demographic analysis and projecting and looking at what makes cities function well. So Strong Towns really fits in with my analytical brain well. So that was my first one-on-one with this placemaking movement, and I just kind of latched on to it. By the end, this was so phenomenal. Council members were throwing frisbees. It was really impactful. So I said, “Okay what’s the next step, guys?” And they just went, “Well, I guess it’s up to you.” There was absolutely no direction and I was so miffed by that. [They] were just going to come in and then run away. How do we make it permanent? So I decided I was going to figure out how to do this. As we began, we did Friday lunch food trucks and evening concert series throughout the summer. We were thinking, If we can find a way to get people on the plaza in the summer, we will absolutely have them there all other times of year. We planned events May through October. There were community cultural events and workshops with kids. We came up with creative ideas and collected who the users were. At one point we had kites for rent. That experience kind of defines the process I use in my company now. So what we did with Plano was we identified, Okay what are the pain points here? What is this demographic—who are these people? So we came in with our own set of solutions, then figured out what were the problems and what were the assets we could build on. Through those conversations we narrowed it down to the placemaking parklet. It was great to have the Gathering as a reason for them to look more closely at these issues. AB: Do you find drawing the business owners in is an important step to making walkable and bikeable places? AP: I’d say probably just identifying your allies is the biggest thing to do. There’s hopefully a lot of allies downtown. Our philosophy for this placemaking stuff, because it can be so contentious—I’m sure John’s run into this issue too—you will bring out people with pitchforks. People just get upset about this kind of stuff. So our biggest priority is to always find our allies. Find the creatives, find the entrepreneurs, find the people who are forward-thinking, find the young people in town, find the bike clubs. The historic society is usually a good one. They understand that preserving these old buildings means getting tenants in them. That’s a clear connection I’ve heard from historic preservationists. AB: One thing that came up during your presentation, that you addressed, was the concern over the potential role of bike infrastructure in gentrification. Do you think it does play a role and how does that weigh in? AP: Yeah I guess it’s about who’s advocating for those bike lanes and who’s leading that conversation. Ideally, if you have the neighborhood pushing for it, like here in our neighborhood of North Oak Cliff, we have our Bike Friendly Oak Cliff group pushing our council member to make more bike friendly infrastructure. So our neighborhood is grassroots pushing for bike infrastructure because it’s a gentrifying neighborhood. I think if you have it the other way around, if the city is putting it in, it could be seen as a gentrifying element they’re forcing on the neighborhood. It becomes the Bike Lanes are White Lanes kind of issues that we were talking about, where they have so many greater needs. It’s almost like a slap in the face, but it’s not respectful to assume that’s the one thing the city should be spending one million dollars on in their neighborhood. That is what hit me most from that book. AB: Speaking of equity, one of my favorite concepts from your talk that I hadn’t thought about before as a bike advocate in my own city, was the idea that “bike lanes are mobility lanes.” This idea hit me, especially because my city doesn’t have ADA-compliant sidewalks outside of a few business districts, that people who use wheelchairs or other modes of transportation can also benefit. JS: That’s exactly what we’re seeing as part of “The Big Jump Project” in multiple locations. One of the installations, I think it was New Orleans, they actually did a stencil of all the different modes they anticipate seeing in these lanes, including wheelchairs. Changing our verbiage from “this is a protected bike lane” to “this is a mobility lane” makes it clear that this is a welcome space for people getting around through multiple modes. In some cases, there may be no other place to walk either. So it really does get away from the concept that it’s bikes and bikes only—it’s not. It really is about mobility. AB: To end, I wanted to ask each of you about your favorite success stories, whether it’s an installation or project or city you think is doing well. JS: There’s so many wonderful success stories going on out there. I’d probably turn to New Orleans, because one of the things they’re doing, like Fort Collins, is engaging a large community group to help with the installation of these pop-up demonstrations of protected bike lanes. I think it’s so incredibly important that you have that community engagement because you’re able to diffuse the negativity, the NIMBYism, or the fear associated with change. All the way down to being able to identify where the dock-based bike share should be located, getting that buy-in and support is so important on moving the needle to becoming a more walkable and bikeable community. AP: For me, one indicator is when things go mainstream. It’s interesting to watch like what New York City has done as far as mainstreaming things within their city culture. Getting residents used to this idea of placemaking is something cool to see. The bigger impact is Urban Land Institute or other organizations that aren’t typically thinking outside of the box have become drawn to this stuff as well. It’s interesting to hear these terms being used by these bigger more institutionally funded projects. So it’s fascinating to hear people talk about placemaking as a way of getting a community art organization involved in a development. They’re utilizing this idea of finding the creatives and the entrepreneurs on a massive scale. I’m seeing the vocabulary go from “we can’t” to “okay, here’s what we need from you.” I’m finding more and more that cities are willing to rewrite the rules. Aubrey Byron serves as Membership Coordinator and Staff Writer for Strong Towns. She's a writer based in St. Louis, Missouri. Aubrey began engaging with public space as a cyclist and spends much of her free time trying to inspire more people to be comfortable on bikes through the advocacy of a local nonprofit, The Monthly Cycle. She is also passionate about outdoor adventure and reading.